The presenter then has to open another door in the for loop starting at line 28, but must not reveal the main prize. In the revealed attribute, the object stores this door's index. The remaining third door's index is then saved in the alternate attribute. The for loop starting in line 50 iterates over 1,000 game shows, and the print() statement on line 55 outputs their results in CSV format. This is, line by line for each show, the indices of the candidate door, the presenter door, the remaining door, and the winning door. If the AI apprentice employs a neural network and feeds in individual shows as 3-tuples, each paired with a one-part result tuple in the training phase, it won't produce satisfying results because door indices aren't really relevant as numerical values; instead, they stand for categories, each door representing a different category. The AI expert transforms such datasets before the training run into categories using one-hot encoding. 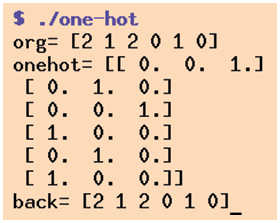 If a dataset provides values for n categories, the one-hot encoder shapes individual records as n-tuples, each of which has one element set to 1, with the remaining elements set to . Figure 3 shows an example of how an input series like [2,1,2,0,1,0] is converted into six one-hot-encoded matrix rows. The code in Listing 2 uses the to_categorical() function from the np_utils module of the keras.utils package to accomplish this. To return from one-hot encoding back to the original value later, use the argmax() method provided by numpy arrays. Figure 3: One-hot converts values into categories that set one value per tuple to 1. Armed with the input values in one-hot format, the three-layer neural network method defined in Listing 3 can now be fed with learning data. Important: The network also encodes the output values according to the one-hot method and therefore not only needs a single neuron on its output, but three of them, because both the training and, later on, the predicted values are available as 3-tuples, each of them indicating the winning door as a 1 in a sea of zeros. The saved training data generated by Listing 1 in shows.csv is then read by Listing 3 in line 7. The first three elements of each line are the input data of the network (candidate door, presenter door, alternative door), and the last item indicates the index of the door to the main prize. Line 12 transforms the desired output values into categories in one-hot encoding; lines 14 to 18 build the neural network with an entry layer, a hidden layer, and an output layer. All layers are of the Dense type; thus, they are networked in a brain-like style connecting with all elements of adjacent layers. The Sequential class of the Keras package holds the layers together. Line 20 compiles the neural network model; Listing 3 specifies the error function as binary_crossentropy as the learning parameter and selects the adam algorithm as the optimizer, which specializes in categorization problems. In the three-layer model, 10 neurons receive the input data in the input layer and input_dim=3 sets the data width to 3, since it consists of 3-tuples (values for three doors). The middle layer has three neurons, and the output layer also has three. The latter is, as mentioned above, the one-hot encoding of the results as categories.